BioNike, A Skincare Solution For Sensitive Skin! 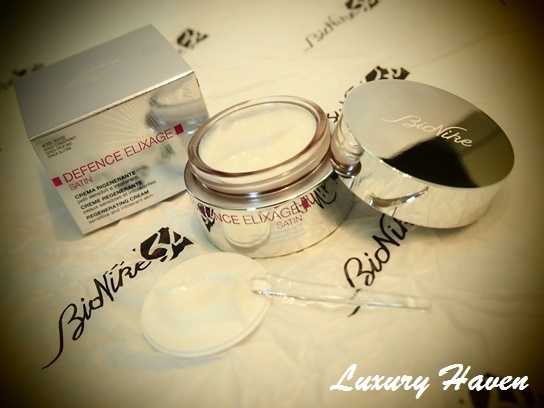 You are here:Home » Product Reviews » BioNike, A Skincare Solution For Sensitive Skin! Pronounced as bee-o-nee-kay, BioNike specialises in the research, formulation, production & marketing of dermocosmetics for sensitive, allergic & reactive skin. Sensitive skin is a condition that affects mostly the female population. Unlike normal skin, it reacts more intensely to several factors, sometimes concurrent & of different nature: physical (UV radiation, cold, heat, wind), chemicals (cosmetics, aggressive cleansers & environmental pollutants), psychological (stress) & hormonal, showing redness, stinging & burning. When skin is hypersensitive & intolerant, these unpleasant sensations increase because skin's tolerability threshold against external triggers is lowered even further. 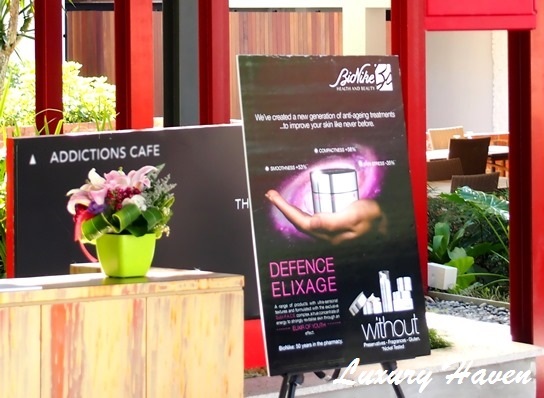 Guess I’m one of those fortunate ones with normal healthy skin, but I just couldn’t decline the invitation to BioNike’s recent product launch at the Chameleon Club in Dempsey Road. Why? Simply because I was really curious about their products…….. NO Preservatives, NO Fragrances, NO Gluten & Nickel-Tested? Wow! At the event, my guest & I learnt that #BioNike products are highly effective & are based on their "allergen-free philosophy", that is products with no preservatives, no fragrances, no gluten & nickel tested! In fact, nickel, preservatives & fragrances are well known skin sensitizers that are responsible for triggering contact allergies. Visit BioNike Clinical Tests for more details on the above. Before the introduction of BioNike products, I was totally ignorant of those products for sensitive skin since I don’t have any of these concerns. I got to learn that Gluten intolerance is a specific condition linked to the difficulty to metabolise the gluten in wheat & other cereals such as rye, barley, etc. It’s remarkable that they actually have skincare products that are #GlutenFree, & that those with sensitive & allergy prone skin can now safely apply BioNike’s fragrance-free formulations. 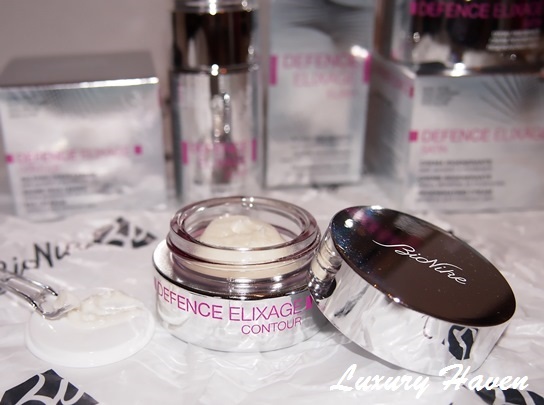 Now, let’s take a look at their recent product launch – the DEFENCE ELIXAGE, a revolution in anti-ageing treatments! How much do we actually pay attention to our lips? Both daily eye & lip care is essential, & this BioNike DEFENCE ELIXAGE Eye-Lip Balm Contour (SGD 149, 15 ml) works great in multi-tasking to nourish the delicate, thin eye & lip contour areas. Plus, the balm provides an immediately perceived filler effect! The exclusive Subli-F.A.C.E ingredient complex works on all ageing signs, leaving skin toned & supple. 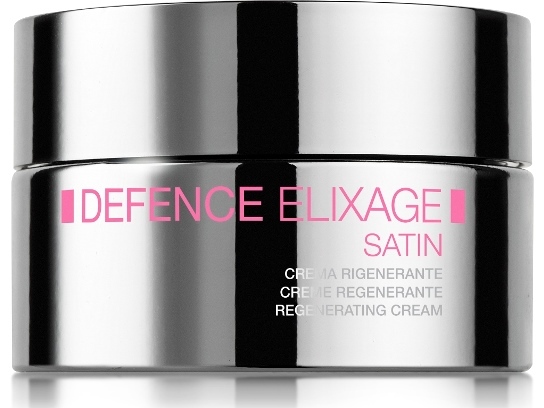 DEFENCE ELIXAGE Regenerating Cream Satin (SGD 339, 50 ml vase) - Here’s an intensive anti-ageing treatment for normal & combination skin. With an ultra-sensorial, light & satin texture, the cream provides a triple anti-ageing effect to promote skin’s natural regeneration mechanism, enhance repair processes & counter damage from free radicals. Skin is left toned, smoother, radiantly alive & appears as regenerated: wrinkles are softened & facial features are more defined. 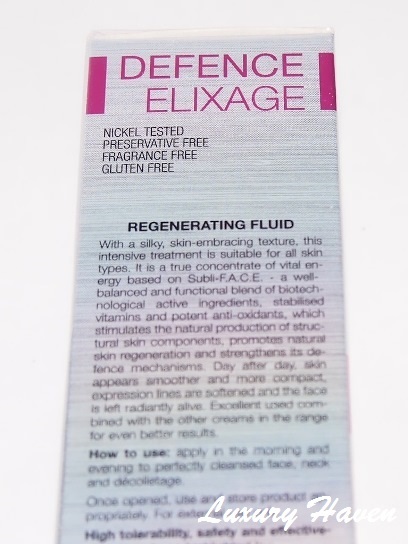 For a more enhanced result, combined with the DEFENCE ELIXAGE Regenerating Fluid Elixir (SGD 349, 30 ml bottle). With a silky skin-embracing texture, it’s a true concentrate of vital energy which stimulates the natural production of structural skin components, promotes natural skin regeneration & strengthens its defence mechanisms. Day after day, skin appears smoother & more compact, expression lines are softened & the face is left radiantly alive. Besides the generous goodie bag filled with 3 full-sized BioNike DEFENCE ELIXAGE range of products, included was also a pretty sachet bag containing lots of samples. Thank you BioNike, for the media invitation which was most informative! Finally, a product that takes care of the sensitive skin without any Preservatives, Fragrances, Gluten, & it’s *Nickel-tested! Though the BioNike products are fragrance free, they’ve a nice mild scent. Texture is rich & creamy, except of course for the fluid; they’re non-greasy & give a sheer lustre to the skin upon application. As our age increases, the natural Hyaluronic Acid content that's crucial for water retention in our skin decreases. Once you hit 45+, your skin becomes thinner, & loses much if its strength & elascity. Since I'll be joining the 50s Club in two years time, you can understand why I’m especially fond of products with #HyaluronicAcid as it gives me long-term hydration. It's great to know that BioNike's Regenerating Cream Satin has this property that I badly needed. I love those 2-in-1 products as it saves time, so the Eye-lip Balm is just perfect for me too. 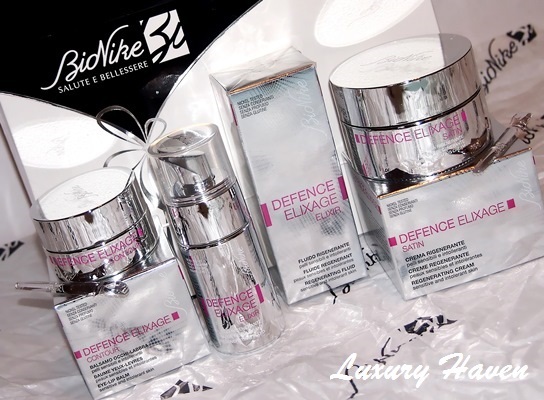 The BioNike #DefenceElixage, a true concentrate of energy, with a blend of precious emollient ingredients to strongly revitalize skin through an “Elixir of Youth” effect! The continued success of BioNike products is also due to the strong relationship #ICIM has been able to establish over time with the medical community - dermatologists, paediatricians, allergists, & pharmacists. The company closely works with doctors, who can understand & & support the benefits the company's product range can offer, thereby boosting the market success of their products. Isn’t it nice to know that we’re in safe hands? Do you own any Gluten-free or Nickel Tested skincare products? What skincare products are you using? No, I didn't really read the small fonts written on the skin care I am using now... at the moment, I am using different types of skin care on my face... I think it is not that "fine", right? Wow, interesting to read about the products, certainly intrigued with the eye lip balm contour and as fillers too??. I have to check and I think its not in our shores yet. Must, must, look, look out. Nava, impressive, isn't it? Enjoy your shopping! The packaging definitely looks very classy. I love this sentence - stimulates the natural production of structural skin components, promotes natural skin regeneration & strengthens its defence mechanisms, this is really important as we grow older, the skin's ability to renew itself slows down. Eye and lip balm in a bottle - interesting.......definitely have to be on the look out for it. Wow, it was news for me you joining the 50's club within 2 years time. Can't believe though, you look much younger. Please share with us your anti-ageing secrets ! The Bio Nike website has some very interesting facts about Sunscreen use. They have mentioned about finding out the skin phototype. This is actually the degree of the skin's reactivity when we get exposed to Sun. Based upon this correct Sun exposure and the type of Sunscreen are recommended. Click the 'Ask our experts' link on their website and get much more important info ! Rajiv, no big secrets..... just that I don't smoke nor drink, use good skincare products & remember to take my food supplements :) Yap, BioNike has a very informative site! Thks Rajiv, & have a good week! Wow, you are awesome ! You are absolutely right, smoking and drinking are bad for health. What I have observed about you is your positive attitude in general to everything in life as reflected by your writing style here also have a role in you looking younger and beautiful. Too much stress makes people age quickly. Have you checked your "real age" ? Try www.realage.com Dr Oz is actively involved here, live life to the youngest ! I stopped using lipstick and other products only because there was gluten in them. It was nice to know bionike products are gluten free. Bal, the first person I thought of was you when I learnt about BioNike's gluten-free products. Seriously! YL, hahaha! Don't think anyone wants to see an aunty posing with a gun. May have negative impact. Lol! Please advise why Bionike products are always so badly stocked. My nearest store is Dischem, Centurion Mall and I have had problems getting various products for a number of years. I am currently looking for the B-Lucent face cream - can you advise the nearest store where I can find this product? Irene, thks for coming by! Kindly email your concerns to BioNike Contact for them to revert to you. Have a wonderful weekend! Pepper, hahaha! Love your wit! I'm using the bionike ,Acnet tablet and within two weeks I've noticed that all the pimples surfaced, and its c∕̴Ɩ bit itchy..... My question is, its this part of the cleaning process or should °̩ be concerned , because I've been told that in order for your face to clear, the pimples need to surface? Oh dear, I'm so sorry to hear that! It's true that certain products require the pimples to surface in order for them to clear. But I strongly suggest that you visit your nearest BioNike outlet to have your skin checked by their beauty consultants. Here's their facebook link if you're residing in SG: https://www.facebook.com/BionikeSG. Speedy recovery! Hi am on the three months tablet treatment with bionike is it normal to have alot more pimple appearing during this period ? Hihi! I've gotten a reply from Bionike saying that they currently don't supply tablets for acne in Singapore. They've directed you to post your query at http://www.bionike.it/drop-a-message_en_0_7_38.html. Hope this helps! Hi there, can Bionike Triderm Marselle Liquid Soap be used as a facial cleanser? I bought it yesterday and it stung a bit when I used it, and today my face (I get eczema sometimes) feels tight and very sensitive. Thanks! Hihi, please email do drop an email to gelynn@xiaoyuan.com.sg. We will reply to you promptly.